Soul Food for Hungry Adult Communities: 28th Sunday in Ordinary Time, . Oct.13th 2013. 28TH SUNDAY IN ORDINARY TIME, YEAR C: LUKE 17:11-19. October 13, 2013. As Jesus 'set his face for Jerusalem', he had to journey south along the border of hostile Samaria. Gospel: Luke 17:11-19. Read it for yourself, in your Bible or Missal, or click here. It’s not nice to have our Favourite Prejudices exposed. ‘Please, may I hold on to mine?’ Jesus won’t let me! Well, today we are being challenged both about our ingratitude, and about our prejudices. Neither is comfortable territory. We are journeying through borderland territory, here. Luke 9:51 ‘As the time drew near for him to be taken up, he resolutely turned his face towards Jerusalem’. ‘As they travelled…’ (9:57) ‘In the course of their journey…’ (10:38) ‘Through towns and villages he went teaching, making his way to Jerusalem.’ (13:22). ‘Now it happened that on the way to Jerusalem he was travelling along the border of Samaria and Galilee.’ (17:11) His journey wasn’t just geographical! And this ‘…along the border of Samaria and Galilee’ (17:11) is the setting of today’s Gospel. A tense place to be, because of the hostility, the animosity between the Palestinian Jews and their Samaritan neighbours. Each group considered the other to be heretical, and despised the other. Sounds familiar? Jesus didn’t recognize such borders;- for him, each person and each group was hugely important, and he despised nobody whatever. Still holds true, for him if not for us. And maybe that was the real ‘leprosy’ that he encountered,- that despising of one another. 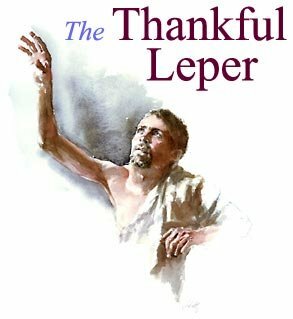 The ten lepers, outcasts, unclean, had to keep their distance from others. No mixing please! Keep away! And that’s how they had to live their lives each day,- kept out. But when they see Jesus passing by,- ‘on the way to Jerusalem’ and all that Jerusalem would do to him,- they call out ‘Jesus! Master! Take pity on us!’ And Jesus did. He told them to go off and do what was usual when a person was cured of their skin disease,- ‘Go, show yourselves to the priests!’ In other words, you are already healed of your disease. They were so excited at their healing that they went to their friends and families,- but forgot who had healed them. Except that one. He came running back to say a huge ‘Thank You Jesus!’ And who was he? A Samaritan, of all people,- one of the Despised. The real Outsider as far as the Jews were concerned, at that time. When we see someone whom we despise or look down on, doing a really good deed, like saying such Thanks, it upsets our prejudices. (Remember that other story also of ‘the Good Samaritan’?) People can be full of a goodness that we refuse to see or acknowledge. We prefer to hold on tight to our prejudices towards certain people. But Jesus challenges his hearer’s prejudices, then and now. We have ‘borders’ in our hearts, for In and Out, Us and Them. Jesus doesn’t. Jesus praises the Them, to Us! And the Us to Them! 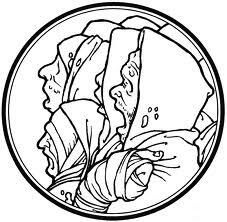 And maybe it’s We who have that leprosy, that disease that’s more than skin-deep, the disease of despising or closing out, or giving the old shoulder, to certain other people and groups. And the disease of not being grateful. And when he does, and heals our hearts, we turn back praising God at the top of our voices from the bottom of our (healed) hearts! And that’s livin’ ! ‘Jesus! Master! Take pity on us!’ – our daily prayer when we bring our hearts and homes and communities and world to him. ‘Change the names, and the story is about yourself’ (Horace). Share it with a friend or two. ← SOUL FOOD for Young Adult Communities: October 6th 2013, 27th Sunday in Ordinary Time.